Pope Urban VI and the Roman People. Saint Catherine in the bottom right. 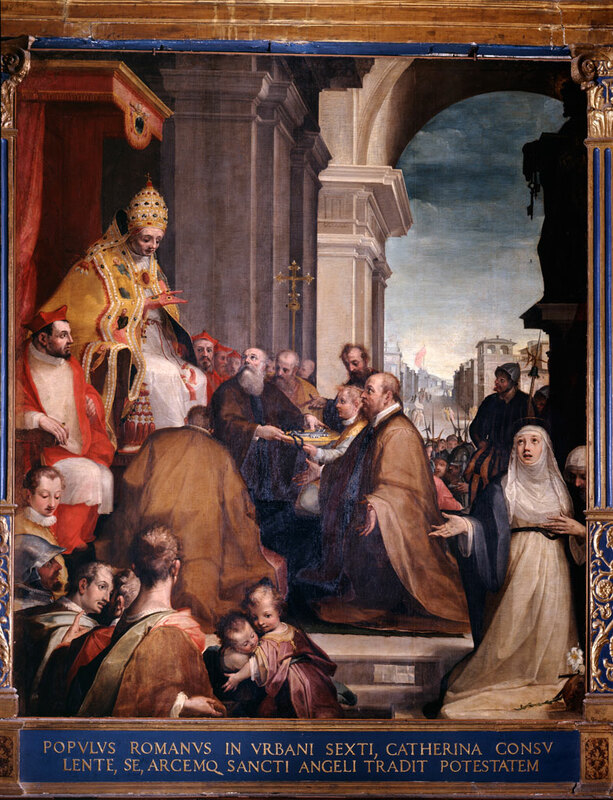 Catherine supported Pope Urban VI’s(b.1318-d.1389) claim to the papacy after Pope Gregory XI died which resulted in the Great Schism.1 After Pope Urban VI was elected, he became temperamental and several French cardinals left Rome and voted for a new pope, Pope Clement VII, also known as the Anti-Pope.2 Catherine, and the rest of Italy, favored Pope Urban VI as the true pope. Pope Urban called Catherine to Rome in 1378 and she remained there until she died in 1380.